A contact form is an important part of a website. It helps readers to contact webmasters for inquiries, feedback and suggestions. Thus it ensures a smooth connection in between both the parties. How can you create a simple, secure contact form in WordPress? While creating a contact page, you should pay attention to the security side. Otherwise, you will get tons of spam comments from bots and others who want to inject malicious code on your website. 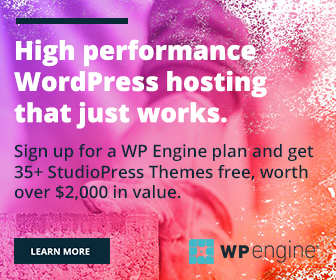 We have seen a number of top-rated contact form plugins in this post. They are free and easy to use. Contact Form 7 is our favorite plugin to add fast and customizable contact forms in WordPress. It lets you insert as many as contact forms anywhere on the site using a shortcode. Upon activation, it will add a new menu in the left sidebar. Tap Contact > Add New to create a new contact page. A default contact form will be shown there with basic fields including Name, Email, Subject, Message and Submit. Just above the content area, you can find various tools to create a new contact form or customize the existing one. <label> Your Name </label>: Label of your field. (required): Indicates the user must fill this field. [text* your-name]: Text field where you can enter text. [email* your-email]: Field where you can type an email address. Let’s check how to add a new field in your contact form. 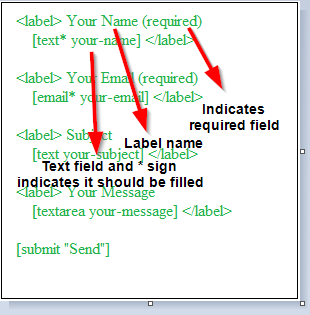 Check the Field type box as required. 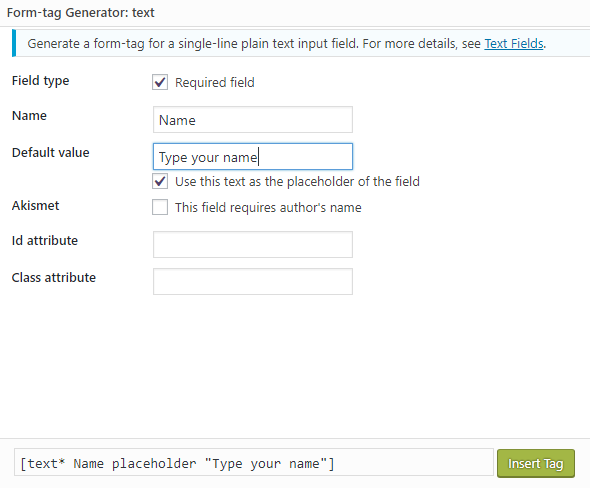 Check the following box to show your default value as placeholder text. Click Insert Tag button. How to set a minimum and maximum length for the fields? Insert minlength:4 maxlength:10 fields just after the text field name. The number can be customized as per your needs. It will generate the following output. A CAPTCHA box should be added in order to prevent spambot comments. It is a free service and you should obtain reCAPTCHA API keys from Google for integrating with your site. Open Contact > Integration to configure keys. Go to google.com/recaptcha and tap Get reCAPTCHA button from the top right side of the screen. Sign in with your Gmail account first, enter a label name to easily identify the site and choose a CAPTCHA type. Accept terms of service and Register. It will show site key and secret key now. Copy and paste them into the integration page of the plugin. Save settings. The reCAPTCHA is ready to use on your site. We’re going to insert Email, telephone number, radio button, drop-down, text area and reCAPTCHA boxes in this sample contact form. [tel TelephoneNo:]How do you hear about us? Name and save your form. It will generate a shortcode which can be used to display your form in posts, pages and text widgets. Go to Contact menu in the left sidebar, open Contact Forms to view, edit and delete your form. Mouse hover the desired form to show the Edit option. In the Edit view, you can personalize other parts of the form including mail and default messages too. To delete a form, go back to the previous screen where you can see all forms at once. Check the form name that you want to delete and click on the Bulk Actions drop-down box to see the delete option. Choose it and hit Apply.